FinTech trends are changing on a yearly basis. As with any other industry based on innovation and technological breakthroughs, it evolves at a rapid pace, turning older tendencies into the new “normal” and setting new targets to achieve. 2018 was another year of a crazy race for better solutions and more value for each customer. The industry proved the fact that Blockchain is not only about Bitcoin, AI is also not only destined for sci-fi and collaboration has so many other ways to look at it efficiently. All of that and more is covered in-depth in the next parts of this article. FinTech funding set a new record with H1, 2018 investments surpassed the numbers of the whole 2017. We are looking at a young and already booming industry. 2018 has shown a lot more depth to the potential of the entire sector, and we are brave enough to single out the Top 5 FinTech trends of the year. Higher. Faster. Stronger. The year was highlighted by a new stage of the global innovation race. Financial institutions were investing heavily in new technology, and startups were coming up with their insanely good ideas and fintech outsourcing firms were on a tight schedule, trying to complete every single contract. While fintech stands for technology, for the most part, it is also imperative to support a collaboration ecosystem where everyone contributes to the general development of industry, while sustaining a competitive market. Here's what inVeritaSoft thinks to be the most mainstream trends within the fintech industry in 2018. When an establishment, and particularly a financial institution, becomes at least moderate in size, the operating costs skyrocket. Thousands of user inquiries require tons of effort from human support staff, and the numbers continuously go up. FinTech enthusiasts have already come up with a solution - an AI-enhanced chatbot that answers most of the questions or redirects the user to human staff if the issue is too complicated. No inquiries are ignored this way, and customer support staff gets a mountain off their shoulders. Autonomous’ report suggests that such technology can save up to 22% of operating costs - that's $1 trillion. Cleo, an AI helper, does a pretty good job at finance management. Users can set budgets, require spending analysis and so forth - the assistant will provide reports and offer other help to keep your money well-managed. Artificial intelligence can be trained to analyze the markets and provide valuable information for traders and analysts. The potential behavior of a particular stock in the near future, help with assessing risks and finding solutions to issues that occur during asset management and so forth. 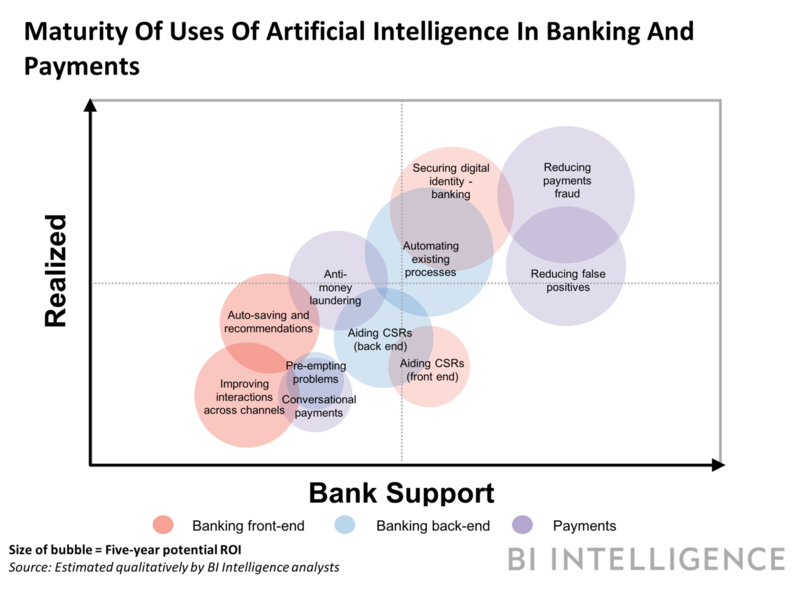 AI and ML (Machine Learning) can make a big difference in the financial sector and prove valuable for investment or banking firms. It is visible that AI is used for a vast range of purposes, leaving even more space for innovation, securing the spot for this trend in the next year's summary. Passwords are still a dominant way of authentication. The issue becomes extremely important within the financial industry, where security and privacy matter the most. FinTech is already using biometrics to create an alternative for passwords. Face scans, voice sampling, fingerprint authentication - fintech service providers have put in a lot of effort to make it succeed in 2018. The trend shall go on - Goode Intelligence has released a report stating that by 2020, biometrics will be the primary means of authentication across all industries, primarily financial. Biometrics makes remembering passwords and PINs an obsolete activity, leaving everything to the way you look, sound or tap on the smartphone. The field is relatively unexplored, and there is much to improve. Therefore we agree that this trend will most definitely be present in the next years, up until it transforms from an innovative solution to a routine. 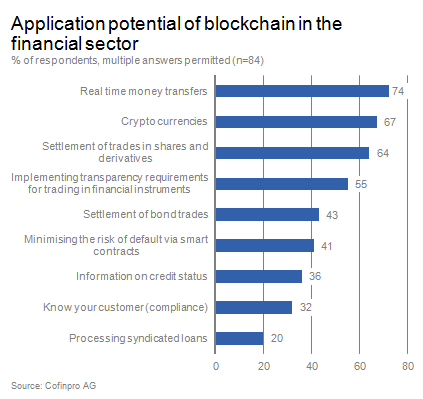 Still largely unexplored field of opportunities, Blockchain has proven itself extremely useful in the financial industry. Startups were the ones to innovate and build on Blockchain to create brand new solutions. Cryptocurrency and payments that are done with it go without saying. That's what has been there for a while, and now the choice of crypto wallets and trading services is massive. Some innovators prove that it is the least that Blockchain can offer. Smart contracts ensure management and enforcement of the deals. Online ledgers are impressively good at storing data and managing it. According to Calastone, Blockchain can save up to $2.7 billion per year for asset managers. Ledgers are also flexible regarding recording and extracting required pieces of information from it which leads us to believe that we may see large-scale adoption of Blockchain by financial institutions shortly. Transparency is another feature of Blockchain, and it can ensure that a financial system or a mass-used tool has the required safety and transparency fulfillments, while offering a good amount of anonymity where it is due. The financial sector is not new to collaborating for the greater good. As long as ideas and techs shared were non-core and helped create new opportunities, the teamwork took place. FinTech introduced a new level of collaboration. Startups and outsourcing companies have evolved and developed a new corporate culture that values collaboration more. 2018 has been the year of conferences, knowledge sharing, and joint projects. FinTech industry realized that full-scale partnership would not only keep the competition safe but also contribute significantly to the overall development of the industry. This mentality goes internally as well. The firms get more digital, and each member of their team is encouraged to give feedback and offer new ideas. FinTech company of 2018 is an ecosystem where everyone's equal and each opinion matters. It results in the great atmosphere within the companies and astonishing results in business and industry wise. FinTech supports a variety of solutions within this field. Crowdfunding platforms allow users to back someone's projects and ideas, basically becoming investors. Users pledge their money for tangible rewards. It has grown into a multi-billion dollar industry and evolved further in 2018. Peer-to-peer (P2P) lending systems were another thing heavily pursued by fintech companies. These services allow people to lend money to others. The marketplace is conceptually different from the classic crowdfunding because what receivers get is rather a loan than investment. Such services became quite handy for many reasons: many individuals may be denied a bank loan or offered a crazy interest. P2P lending eliminates banks from the equation and, therefore, the need to look "trustworthy" in their eyes. The loan interest is much lower on average as well. FinTech companies cover the whole process of lending, including risk assessment, screening and improving the services further. The financial technology industry is a young one but is already walking giant steps towards innovation and improvement. It has grown to be so big that it's hard to single out ten mainstream trends, let alone cut it down to 5. However, these are the most important ones to look out for. Looking for more information on FinTech and its impact on the industry? Check out the rest of our blog. Want your FinTech solution to be built? We have exactly what you need. Contact us to get your questions answered.